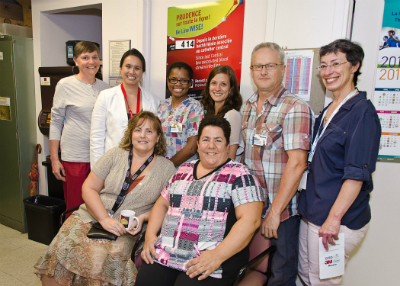 The “Be Line WISE” campaign was officially launched at the MCH and across all MUHC sites on Tuesday, September 10. The goal of the program is to reduce catheter related complications by reminding staff about best practices for the insertion and care of central venous catheters. A poster was created for hospital units to keep track of how many days have passed since the last infection occurred. The boards are located in strategic locations in the NICU, PICU, Hem/Onc, 6C, 6D and Angio and are visible to all families and health care providers.